This page will be used to update and correct the published catalogue. Page viii Apologies to James Pickering for being omitted from the list of acknowledgements. For several years his London mint web pages hosted a lively discussion of the coinage of Roman London. Page 30 Subheading date should be c. AD 296 in place of c. AD 296-7. Page 31 Subheading date should be c. AD 296-297 in place of c. AD 296-9. Page 42 Second paragraph after “Constantine” sub-heading should begin ‘Part 4.04 includes …’ and not ‘Part 4.03 includes …’. Page 80 An additional entry in the Bust Type Table ‘accoutrements’ column should be made as follows to account for a new coin in the LMCC Supplement #1.
o – Right hand holding mappa, globe in left hand. Page 90 1.01.001A The description of Genius in the note for this coin should include the fact that the figure is also wearing boots. See also entry for a new coin 1.01.001B on the addenda page of this website. Page 112 3.01.012 The RIC column for this entry in the table should read “9 & 23b”. Page 112 3.01.013 The RIC column for this entry in the table should read “19 & 25”. 4.02.020 RIC VI cites as the source for this coin ‘C. vii, p. 140 (de Quelen).’ This coin may not exist; see note for the next coin. 4.02.021 Vienna RO 66617 (26.2 mm 7.48g, 7h) Coll. Voetter as cited by RIC. A second example, struck from the same obverse die, but different reverse die, appeared in Trau 1935 lot 3695. Georges Gautier contacted the authors to note this die match. His reconstruction of the history of the Trau example suggests that it was the basis for Cohen’s mistaken description of the obverse legend, which was later followed by Sutherland. The coin was originally published as item No. 2001 in the July 5, 1888 Rollin et Feuardent catalogue of the de Quelen collection where the obverse legend was recorded as SEVERVS ET MAXIMINVS N. B. C. Cohen (C. vii, p. 140, de Quelen, 1886-88) records the legend as SEVERVS ET MAXIMINVS NB. C. Sutherland cites Cohen as his authority for RIC VI 74 (4.02.020). The same coin next appeared as item No. 2076 in the February 5, 1898 Rollin et Feuardent catalogue of the Hoffmann Collection where the obverse legend is recorded as SEVERVS ET MAXIMINVS NO C. The Hoffmann catalogue cited the de Quelen collection as the source for the coin. Since the 1888 inventory of de Quelen listed only one coin of Severus and Maximinus with jugate busts the Hoffman example is in all likelihood the same coin with the obverse legend now correctly read. According to Georges Gautier the coin was purchased by Franz Trau and appeared for the last time in the 1935 auction of Trau’s collection. ‘I suspect that, at the time, it was purchased by Count Cornaggia.’ Those portions of the Cornaggia collection which were not lost in WW II were auctioned by M&M Basel in 1954 but no part of his extensive collection of nummi survived the war. The bust type for RIC VI 74 and 75 is recorded by Sutherland as ‘(A) R., laur., dr.’ The corrected read of the bust type in this catalogue as ‘draped and cuirassed’ is based on an examination of the image of the example provided by the Kunsthistorisches Museum Vienna on which the right shoulder of what appears to be a cuirass can be seen at the left edge. This correction is consistent with Stewartby’s correction to RIC VI 51, the only other coin in this series recorded by Sutherland with this bust type. Stewartby notes of that coin ‘if it exists, it could be of bust C [B3], with the cuirass hardly visible beneath the cloak, as sometimes occurs at this period,’ (Stewartby 1999, 186). The precedent for this design may be two coins of the First Tetrarchy, RIC 276 for Trier showing jugate busts of Maximian and Hercules, and RIC 373 with jugate busts of Constantius and Galerius Caesars and the legend CONSTANTIVS ET MAXIMIANVS NB C. Both of those coins occur in a series dated to AD 298-9 (RIC VI, 186 and 189). Another example of conjoined busts is the gold multiple from the Beaurains or Arras hoard now in the ANS (1967.153.38). Carausius had issued coins bearing the jugate busts of himself, Diocletian, and Maximian. See ‘Prologue’ pages 23-24. Page 156 6.03.007 The bust type should read B2 and not B3. Page 158 6.04.001 A seventh example ROMA Numismatics E-Sale 17 Lot 1017 April 2015 (24 mm 4.26 g 7h). Page 184 7.06.001 The obverse legend should read IMP C CONSTANTINVS P F AVG and is from the same obverse die as the plate coin for 7.04.001. Page 210 In the MARTI CONSERVATORI description “on shield” is missing at the end. Page 270 9.05.032 The Munich coin has now been confirmed (2.92 g 5h). From a different obverse die to the Shrewsbury example. Page 278 The reverse type description for the SECVRITAS REIPVBLICE coin of Helena is incorrect. It is the left hand that it raising the pallium. We mistakenly followed RIC which is incorrect. Page 295 IMP MAXIMIANVS P F IN AVG should point to 3.01 (see supplement #1) and not 5.01. Page 296 The obverse legends table for Galerius Caesar contains some errors. C VAL MAXIMIANVS NOB CAES should be deleted as it does not exist at London. C VAL MAXIMIANVS NOBIL C should be referenced to just Part 1.01. Parts 1.02, 1.03 and 2.01 should be deleted. C VAL MAXIMIANVS NOB C should be referenced to Parts 1.01, 1.02, 1.03 and 2.01 in place of just Part 1.01. MAXIMIANVS NOBIL C (Part 3.01) was accidentally omitted. It should be inserted after MAXIMIANVS NOBILI C.
Page 296 The obverse legends table for Galerius Augustus contains the following error. IMP MAXIMIANVS P F IN AVG should point to 4.03 and 5.01. Page 298 IMP CONSTANTINVS P AG (Part 8.05) was omitted from the obverse legends table. It should be inserted after IMP CONSTANTINVS P AVG. 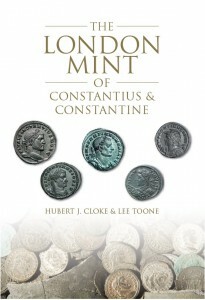 Page 299 For consistency, FLA CONSTANTIVS NOB C should precede FLA CONSTANTIVS N C in the obverse legend table. Page 302 The reverse type description for the SECVRITAS REIPVBLICE entry is incorrect. It is the left hand that it raising the pallium. 3.01.011.5 This number is incorrect and should be amended to read 3.01.009.5 as the legend IMP MAXIMIANVS PIVS F AVG (the newly identified legend) should come between IMP C MAXIMIANVS P F AVG (.009) and IMP MAXIMIANVS P F I AVG (.010 and .011) as per the obverse legends table.